Wal-Mart Stores is confirming some of the deals it will be push to draw crowds for the day after Thanksgiving. They include a 50-inch Sanyo plasma HDTVs for $598 and $3 children's sleepwear. 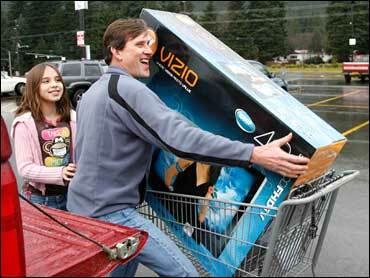 The day after Thanksgiving, known as Black Friday, is considered the official kickoff for the holiday shopping season. It is an important barometer of shoppers' willingness to spend for the holiday period. Melissa O'Brien, Wal-Mart spokeswoman, says that the deals that will be heavily advertised in its Black Friday circular also include Magnavox Blu-Ray disc players for $78, TomTom GPS systems for $59 and $7 reversible fleece jackets. Wal-Mart also on Tuesday unveiled weekly savings starting this Saturday on popular toys and video games that it is pitching as comparable to the Black Friday deals. Wal-Mart and other retailers including Sears have started to hawk deep sales usually reserved for the big sales day after Thanksgiving in hopes of attracting more shoppers early. Wal-Mart said Tuesday that some of the toys that will be discounted starting this Saturday through Nov. 27 are EZ Bake Oven, Disney Princess Scooter and Nerf N-Strike Vulcan. The discounts are up to 60 percent. Customers purchasing certain gaming packages such as "Band Hero" and "DJ Hero" will receive a $40 Wal-Mart gift card while supplies last. Wal-Mart is also offering a 26-inch Vizio LCD HDTV TV for $248, down from $347. Starting last month, Wal-Mart began advertising a selection of holiday toys for under $10, and online the retailer along with rivals Amazon Inc. and Target Corp. have been locked in a price war on highly anticipated book titles, followed by DVDs.